*This post contains affiliate links to products we use & recommend. If you purchase through these links, diaVerge.com may earn a small commission, while not costing you a penny more. Thanks for helping to support diabetes advocacy! OR they think that they don't have time for a massive meal prep once per week. 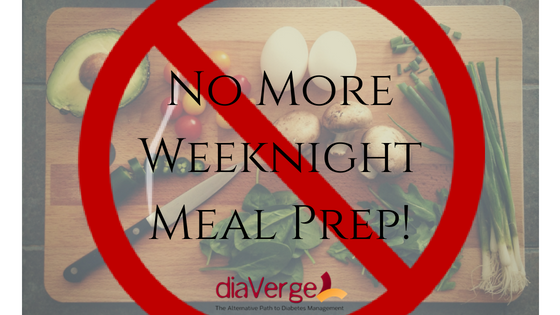 What if a 1-hour-meal-prep session on the weekend translates to 3 hours saved during the week, when you need it most? That HUGE time savings is exactly what I've found with Melissa Joulwan's food prep plan. It has changed my life nearly as much as Dr. Bernstein's Diabetes Solution book. Before I was ready to start Dr. Bernstein's plan (I waited a whole year after reading the book before I attempted low carb), I tried everything. One of those 'everythings' was the Whole30, which was such an incredible experience, I've done it a couple of times and wrote about why I think everyone should complete a Whole30 here. While on my first Whole30, I read Melissa Joulwan's book, Well Fed and was blown away by her simple but brilliant food prep strategy. The book is centered on Paleo eating, which has problems meshing cleanly with low carb in terms of fruit & higher carb veggie content, but we'll ignore that right now. Melissa's food-prep strategy holds true with whatever "home cooking' you're doing. Like Melissa, I love cooking but hate making dinner. When I'm trying to get dinner on the table every evening, inevitably my kids need help with homework, my husband is telling me about his day, it's the busiest time of day online, my dinner pre-bolus alarm is going off, and it seems as though there are a million other things going on. Because of this, I keep meals simple. Plan what foods/combinations you like to eat and the quantities your family will need. Buy groceries using a list and the rough 'menu' you're planning -- there is flexbility if you decide to change the menu during the week. Spend an hour or so cooking all the meat for the week. When cooled, store in containers in the refrigerator. Don't forget your various methods of cooking (roasting, grilling, pan fried, etc) and also include boiled eggs in this protein list. For speed, I often cycle my protein cooking through 1-2 of frying pans -- ie: liver, ground beef, steak all in the same pan, one after another. Then wash, chop and pre-cook the veggies for the week. Blanche, sauté, roast, etc. Here's a recipe to Steam-Saute veggies so they're just slightly undercooked before refrigerating. They'll cook more in the final meal preparation. With lettuce and veggies eaten raw, just wash and chop, if needed. This is a great family project that you can all do together in half the time. Start some music, give everyone an age-appropriate task, and you'll be done in a hurry - all the while enjoying some great family bonding time. Grab a pre-cooked protein from the fridge, grab a prepped veggie- or a few, select how/what you want to cook, and add any type of spice flavor combo that you desire: Italian, Curry, Tex-Mex, Asian, etc. Ground beef or pork, and coleslaw mix/finely chopped cabbage for a 'Crack-Slaw' stirfry. Add coconut aminos/tamari, crushed red pepper and bit of sesame oil for bold flavor. Or, for different flavor, here are a few variations. Sauté some veggies, add smoked salmon, diced sausage, or ground pork, and cover with several beaten eggs for a quick frittata. The possibilities are endless, and you've saved yourself 30+ minutes in the kitchen every evening! This is also a perfect recipe for lunches to take to work and/or school. Never the same thing twice. The key is that ALL YOUR PROTEIN IS PRE-COOKED! Melissa outlines this plan on her blog*, plus includes links to a few of her favorite spice blends. *Keep in mind that the other recipes on her blog are Paleo/Whole30 and mayor may not fit with Dr. B's low carb approach. Melissa's books, Well Fed, Well Fed 2 and WellFed Weeknights, provide a ton of wonderful recipes and logistical meal planning/prep information, although you have to overlook some higher carb ingredients. And finally, to make your busy weeknight meal planning even easier, download our simple Monday-through-Friday meal planning worksheet. I also suggest that you keep record of any new meals/combinations that you try, along with your serving sizes, insulin dosages (quantity and timing), and blood sugar results. If you like this, please share with your friends and groups on social media! Have you tried something like this food-prep plan? Will you try it in the future? What is your favorite variation using this food prep strategy? Leave a comment! Sign up with your email address to receive diaVerge news & updates! Please check your email to opt-in to our newsletter. We respect your privacy and will never share your information. We offer 1-on-1 personal coaching packages, plus our REAL LIFE LOW CARB online course.